50 miniature Davids with a not so miniature male member placed in key locations around the city are a provocatory art project, not just a souvenir gone wrong. The artist Pep Marchegiani is challenging the status of contemporary art in Florence, which he claims "is stagnant, and should re-start from the David." 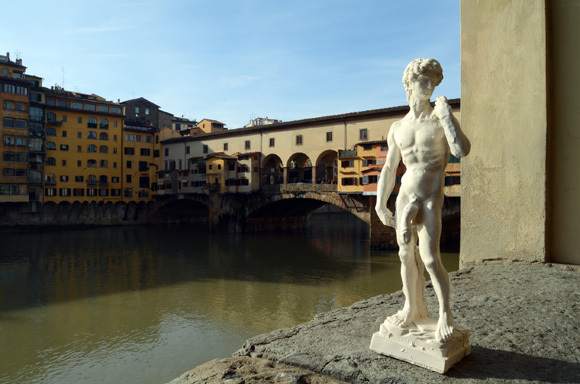 On January 7, 2014, the artist's performance piece was received with perplexed joy by Florentines and the many visitors to the Pitti Uomo fashion trade show, many of whom photographed the item on Florence's bridges, in Santa Croce, at the Uffizi and in piazza della Signoria.. The exaggerated statuettes were accompanied by the CV of an unemployed Michelangelo, who could also be found on a park bench near the Fortezza, selling reproductions for 10 euros. Marchegiani says that Florence's art scene is static, compared to other European cities, to the point that if he were alive today, Michelangelo would die of hunger. The attention-getting stunt is intended as an open letter to Mayor Matteo Renzi to encourage him to help Florence become the new cradle of contemporary art, not just of the Renaissance; to be open to a new, creative future. What do you think? Does the altered David truly get accross the message intended by the artist, or simply attract attention? 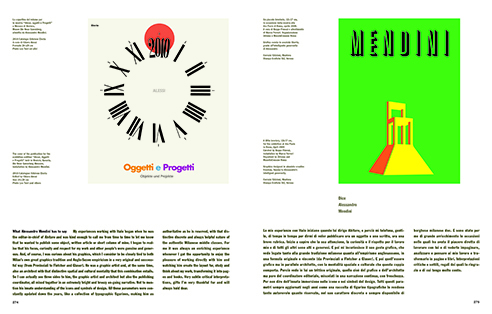 Italo Lupi and Italian Graphic Design are synonymous. Born in Cagliari in 1934, he lived in various places in Italy before residing in Milan, where he graduated from the faculty of architecture at the Polytechnic University. 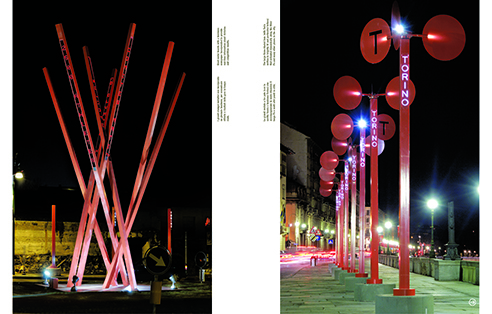 His design career began in concert with Mario Bellini and Roberto Jewelers as three co-art directors for the Office of Development La Rinascente, the department store. Lupi’s skills included signage and exhibition design in the early ’60s. This was followed by an “intense collaboration” with Domus where he was design director. At Abitare he was director of graphics and later and then editorial director. 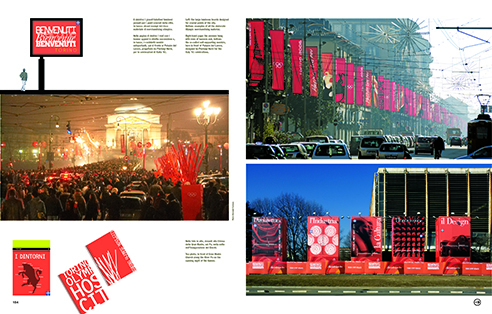 Among his other concurrent feats, he designed the image of the Milan Triennale and communications for IBM/Italy. 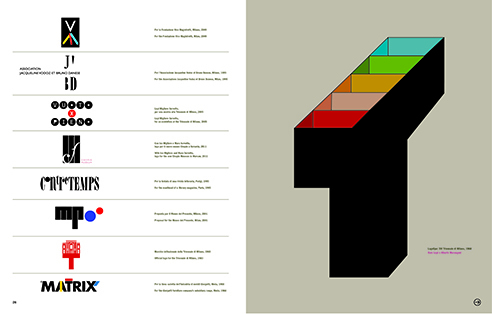 Lupi has designed graphics and signage for large exhibitions at Palazzo Grassi in Venice, the Papal Stables at the Quirinale in Rome, the National Gallery of Parma. His most recent book, Autobiografica Grafica (Edizioni Corraini), is a memoir of design (an autobiographica), aesthetics and art — of the half century he has helped guide and influence Italian practice. I asked Lupi to tell me about book and the joys of designing. What prompted you to write an “autobiography” as opposed to simply a monograph of your work? An "autobiography" can make a book more attractive and intimate and it can sometimes avoid the boring reproduction of your works by introducing life stories. You’ve been defined by your amazing work on Domus andAbitare. What most stands out for you as the highlight of those magazines? Is it the illustration? Photography? Editorial decisions? 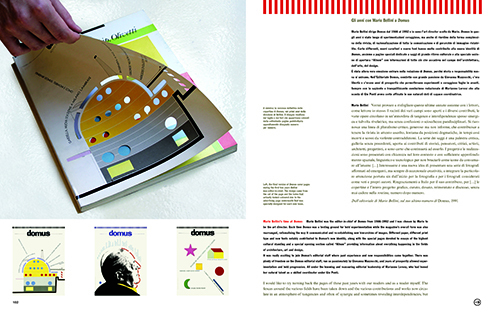 The most fascinating thing, working for Domus at first and then forAbitare, was the opportunity to imagine a real direction and a logical order of complex issues. My degree in architecture from the Politecnico of Milan, gave me the technical and disciplinary know-how to deal not only with graphics but also with exhibition layout which I have always been interested in. All the greatest former Italian designers had a degree in architecture and I followed this tradition. I believe that my curiosity aware of all the fields of design helped me to make Abitare become a well-informed and unconventional magazine. There’s a lot you’ve done throughout your career, from graphic design to interior design. What do you want most to be remembered for? I would like to be remembered for a true mix of the two disciplines. Who are the individuals that made the most impression on your professional life? What’s your “philosophy” about illustration? Or how do you work with illustrators? I loved and still love very much photography and illustration. 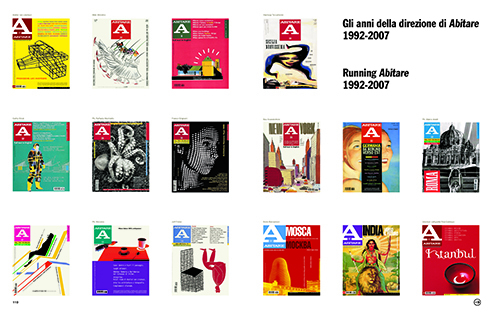 I believe that my editorial policy, very generous towards illustrators, helped many young talents (not only italian ones) to become successful and to increase their work. Since everything in your book is about telling stories, What are the stories that you most enjoy telling? The most important stories are the ones about my juvenile years: this experiences conditioned all my cultural, social and political life. UNESCO Italia: The World Heritage Sites in the Work of 14 Photographers. Masterpieces of creative human genius, architecture that illustrates a significant stage in human history,superlative natural phenomena, areas of exceptional natural beauty - such sites are designated and protected by UNESCO as World Heritage Sites. Of these 981 marvels of design and nature worldwide, 49 are in Italy - more than in any other single country. The Museo Italo-Americano and the Italian Cultural Institute are currently exhibiting images of Italy's UNESCO World Heritage Sites, seen through the lenses of several pre-eminent Italian photographers. Mariella Poli, interdisciplinary artist and Professor at the CaliforniaCollege of the Arts, will talk about the art and method of the exceptional photographers in this exhibit. The exhibitions at the Museo and at the IIC will remain on view until the 26th of January. NO CHARGE for members of the Leonardo Da Vinci Society, Museo Italo-Americano, or Italian Cultural Institute; $12 suggested donation for drop-ins. This film is Italy's entry into the 2014 Oscars. I've seen it once but it needs to be seen again to comprehend all the nuances and details, not to mention to drink in all the wonderful cinematography. First: Italian offers career opportunities. Italy is the eighth largest economy in the world, slightly behind France and the UK, of the same size as Russia and still much larger than India. Its beauty and charm sometimes overshadow its economic dimension; the recent euro-crisis has not helped in this respect. Italy is not only a cultural superpower, but also a major global manufacturer. The recent takeover of Chrysler by Fiat might have brought this to people’s attention. Now, no matter how hard we try, we Italians are still far away from a flawless command of the English language. We do need native English-speaking managers and qualified personnel, in a large amounts, to sustain Italy’s business in its international outreach. Of course, this line of reasoning is all the more compelling if your kids would like to pursue a career in the world of design, architecture, art restoration, music and arts in general, in which Italy excels globally. For Americans, who already speak the “lingua franca” of the world, the Italian language can be a powerful tool to find jobs in the internationalization of the Italian economy and the Italian society at large. Second: Italian makes you special. If this argument was not enough, dear parents, also consider this: Italy was the cradle of Western civilizations, from the Roman Empire to the Renaissance, and produced a unique cultural heritage. The Reputation Institute ranked Italy first in the world in 2013 for culture. If your children learn Italian, they are bound to stand out in the crowd as those who have a robust background in humanities and understand Dante, Leonardo, Michelangelo and Rafael — as well as the multiple expressions of the Italian cultural genius. In a world that is increasingly flat and homogenized, people who speak Italian have a clear understanding of the “fundamentals” of our world. This is a definite plus in society for everybody, be they engineers, marketing managers or designers. Third: Italian is beautiful and fun. Let me add the icing on the cake. Italian is beautiful and fun! It is beautiful because its abundance of vowels makes it very musical. Opera fans know what I am talking about. It is fun, because Italians are friendly and open — and they won’t hold a grudge if your pronunciation is not perfect. By the way, Italians are probably the staunchest admirers of America in Continental Europe: we just love the Americans’ jovial approach to life when you come to visit our cities. Also, Italian words pepper the global modern lifestyle: billions are touched by Italian daily, whether they are singing a capella, complaining of a fiasco or enjoying a cappuccino. It’s fun to understand these words in their original context. Needless to say, all these arguments become existential for Americans of Italian origin. Often their ancestors spoke the local languages when they came to the US. Later they tried hard to get assimilated, for understandable reasons. The new generations of Italian-Americans have the luxury, today, to be able to reconnect with the modern, dynamic, noble side of their historic homeland, thereby regaining a key part of their identity, by learning Italian.